Brand new miniatures for Flintloque and Slaughterloo! 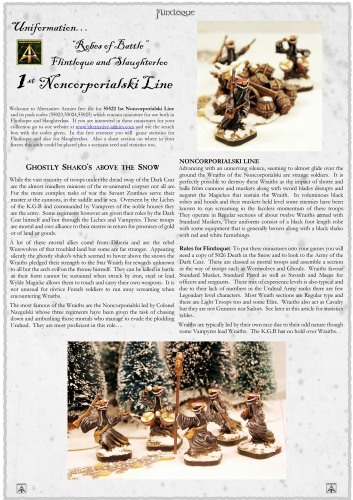 Meet the Wraiths in this article and there is also a free two page Uniformation article to download too. 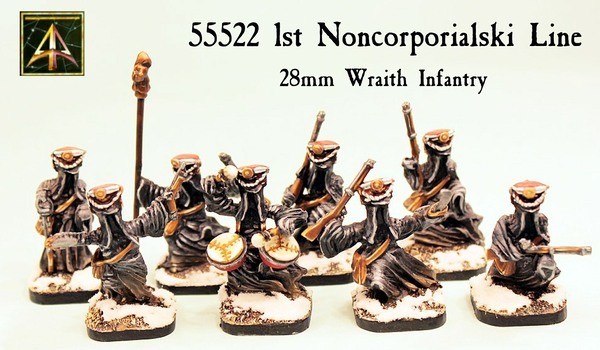 Advancing with an unnerving silence, seeming to almost glide over the ground the Wraiths of the Noncorporialski are strange soldiers. It is perfectly possible to destroy these Wraiths as the impact of shotte and balle from cannons and muskets along with sword blades disrupts and negates the Magickes that sustain the Wraith. 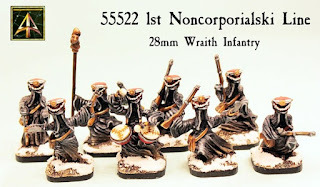 In voluminous black robes and hoods and their muskets held level some enemies have been known to run screaming in the faceless momentum of these troops. They operate in Regular sections of about twelve Wraiths armed with Standard Muskets, Their uniforms consist of a black foot length robe with some equipment that is generally brown along with a black shako with red and white furnishings. This code gives options of a set of ten miniatures for skirmishing or a unit of twenty miniatures with a saving for mass battle or a single trooper booster for customising. 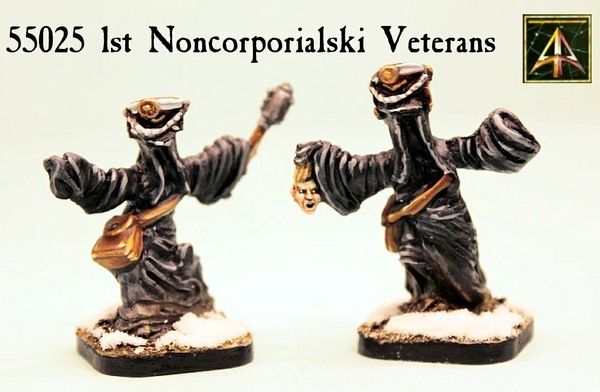 The 1st Noncorporialski Line dressed in robes and hoods are Wraith in the service of the Dark Czar. The skirmish pack contains an officer, musician, standard bearer, sergeant as well as six mixed (from four poses) troopers with Musket. The unit contains this as well as ten more mixed troopers with Musket taken from all poses. Note 55025 1st Noncorporialski Veterans is not included in this mix. When you choose a single trooper booster you will get one of four random poses with Musket avoiding doubles if possible. Easy to assemble. Supplied with 25mm square resin cartouche bases. Assembly required. You can choose also all options painted and based ready for play. Use the options on the product page. Go HERE. 45.00GBP per unit. This pack contains four 28mm scale resin miniatures in four different poses. These are the officers and leaders of the 1st Noncorporialski Line dressed in robes and hoods as is befitting a Wraith in the service of the Dark Czar. Each is composed of a different one piece body along with two separate different arms. An officer with Pistol and Sword, a Musician with Kettle Drums, a Sergeant with Sword and Musket and lastly a Standard Bearer with (white metal) banner pole and Musket. Easy to assemble. Supplied with 25mm square resin cartouche bases. Assembly required. You can choose from a pack or a painted and based pack ready for play. Use the options on the product page. Go HERE. 10.00GBP per pack. This pack contains four 28mm scale resin miniatures in four different poses. Armed with muskets these are the typical troopers of the 1st Noncorporialski Line dressed in robes and hoods as is befitting a Wraith in the service of the Dark Czar. Each is composed of a different one piece body with one arm along with a separate different arm holding musket. Easy to assemble. Supplied with 25mm square resin cartouche bases. Assembly required. You can choose from a pack or a painted and based pack ready for play. Use the options on the product page. Go HERE. 10.00GBP per pack. This pack contains two 28mm resin miniatures in different poses. Add some character troopers or officers to your 1st Noncorporialski Line with these two Wraiths. Each is composed of a different one piece body with one arm along with a special separate arm. One Wraith is armed with a Mace and the other is holding a severed Elf Head. Easy to assemble. Supplied with 25mm square resin cartouche bases. Assembly required. You can choose from a pack or a painted and based pack ready for play. Use the options on the product page. Go HERE. 5.00GBP per pack. We present a free two page Uniformation article which gives background as well as game statistics for Flintloque and Slaughterloo for the Wraiths of the Witchlands. There are also statistics blocks and two new character profiles to put into play. CLICK HERE to download the article which fits in with 5026 Death in the Snow and 5030 Slaughterloo. If you are new to the World of Valon then you will want to check out our Begin in Flintloque page which tells you how to get started. 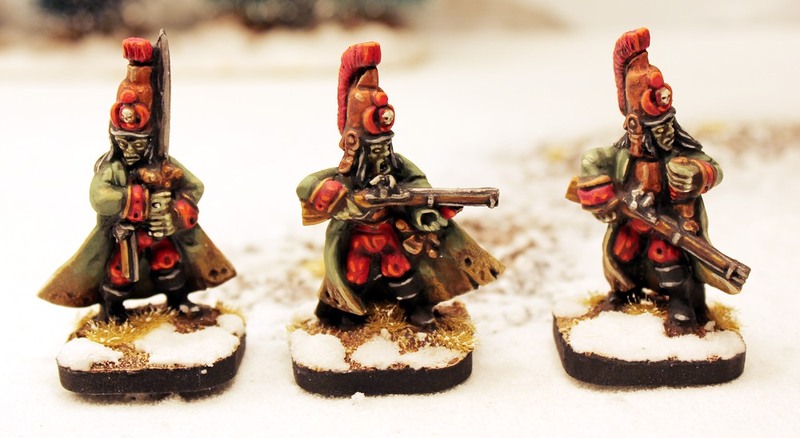 These new miniatures go excellently with 5024 Escape the Dark Czar boxed set and feature in 5026 Death in the Snow game book; put them up against your Elf infantry! For more experienced fans of our game world or those with a collection already you can check out Slaughterloo the mass battle rules on its own page which also features whole divisions of troops in a box (saving usually 18% off list prices). This is our last set of release this month and we do hope you have enjoyed the weeks of fun seeing all the new and great figures and have enjoyed the Mega Event too. Thank you!